HTML5 web project with source code. Sample PHP/SQLite backend. For a detailed guide on the scheduler component setup and configuration please see the HTML5 scheduler tutorial. The scheduler events can be loaded using .events.list property (bulk loading) or using .events.add() method (individual events that are added to the scheduler immediately). This way you can load events for the whole timeline. 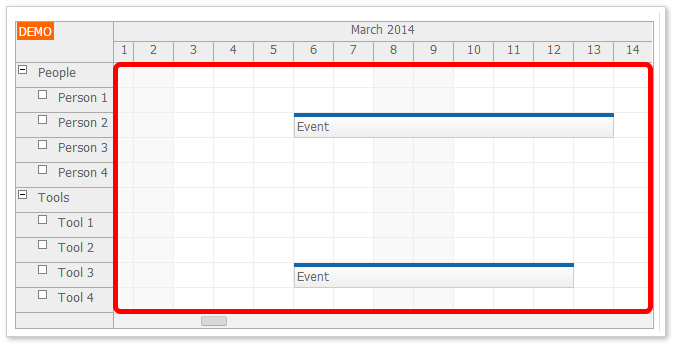 This tutorial shows how to load events dynamically during scrolling. This method load only the data for the current viewport (like in the online map applications). 2. Add onScroll event handler. This event handler will be called whenever the current viewport changes (when the users scrolls). Most AJAX loading methods (such as jQuery .post(), .get(), or .ajax() methods) use a success callback function to read the AJAX request result. In this case, you need to turn on the async event loading using args.async property. The events will not be loaded until args.loaded() is called from the callback function. The sample PHP backend doesn't use the resource list to filter the events - it loads all events between viewport.start and viewport.end. The newly added events are compared with the list of events that are already loaded (stored in .events.list). Matching existing events are overwritten with the new ones.